Oklahoma State Engine Two (Tag #1-20006) attempted to escape the on-coming flaming front by backing up a two-track road. The driver of the vehicle, Presley Byington, stated that after backing approximately 60 feet Engine #2 began to bog down and would not climb the hill behind it. Jim Burnett, Engine Boss, exited the vehicle and attempted to use the engine’s pump to provide protection for the vehicle and themselves. Byington stated the pump’s engine operated only for a few seconds before quitting. Engine #2 was backed a few more feet up the two-track road before its engine stalled. The vehicle was hit by the flaming front moments later. 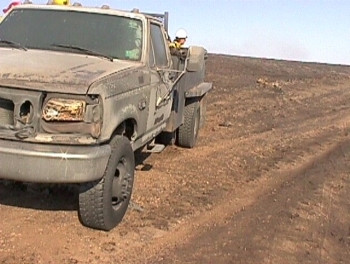 On August 12, 2000, the vehicle’s condition was inspected by members of the Serious Accident Investigation Team(SAIT). The vehicle was heavily damaged by direct flame impingement to the front and driver’s side of the vehicle. Equipment and personal gear packs on the top of the engine’s water tank had caught fire and were heavily damaged or destroyed. The right rear duel wheels had caught fire and burned. All other wheels were charred, but did not lose pressure. The pump’s control panel was heavily damaged but the Hobbs meter was still recording time, the voltage meter was registering twelve volts, and the "on" light and panel light were still functional. The vehicle’s transmission was in reverse, the transfer case was in 2H and the emergency brake was in the off position. The engine was started and functioned normally. The engine’s two-way mobile radio also functioned normally. The driver’s door panel and molding melted and charred from intense heat to the outside of the driver’s door. On August 14, 2000, three members of SAIT returned to the accident site for further evaluation of the Engine’s operation. The spare tire was installed on the vehicle to allow a test of the engine’s backing ability and operational characteristics. The engine was started, and with the transfer case placed in 4H, successfully backed up the hill along Byington’s intended escape route. The engine was returned to the entrapment position. Procedure was repeated with the transfer case in the 2H position. Again, the engine successfully retreated along the escape route with no apparent effort. Byington believed that the engine failed to climb the hill because of the weight of the water carried in the engine’s 250 gallon water tank. However, it is likely the engine stalled due to extremely heavy smoke arriving with the flaming front. Witnesses from Hot Springs Engine #7 and Mark Rudkin, HEMG, stated visibility to be 15 feet and less at the time of the blow up. 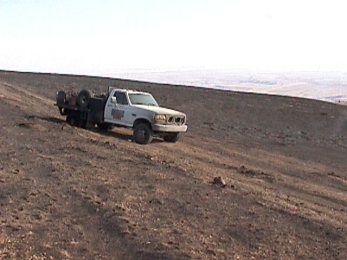 Oklahoma Engine #2 was released to the BIA’s Wind River Agency for removal from the site at 1700 hrs on August 14, 2000. The removal was to occur on August 15, 2000 with subsequent shipment to Oklahoma Department of Agriculture’s Forestry Services.